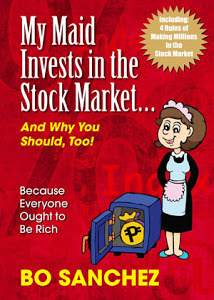 It's more fun investing in the Philippines. The Philippine Stock Exchange Index had reached it's 20 record-highs this year according to this news, In fact as of this writing, PSEi touches 6,700 mark already and continued to break records. "The country’s strong fundamentals drove more investors to the capital markets for funding last year, data from the Bangko Sentral ng Pilipinas (BSP) showed. As of November 2012, corporate bond issuances reached P248.3 billion, 27.2 percent higher than the P194.3 billion recorded in the same period the previous year. 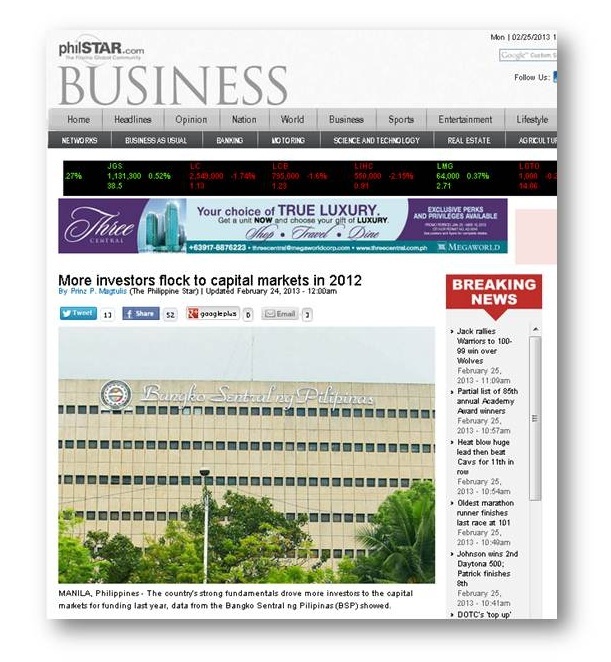 Total equity raised in the stock market, meanwhile, jumped 87.3 percent to P203.5 billion from P108.6 billion. “Corporations are better able to access the fixed income market today… We have seen over the past few years that corporate issuances have risen sharply,” BSP Deputy Governor Nestor Espenilla Jr. said in an e-mail. This has allowed firms to generate funding for operations and expansion, he said, pointing out this could benefit economic activity and job generation in the long run. The Philippines has been a darling to investors as its sound macrofundamentals reverberate across a still fragile global economy. The local economy grew 6.6 percent last year or above its target. Inflation, on the other hand, settled at 3.2 percent last year, falling at the low-end of BSP’s three- to five-percent target for the year. In January, inflation hit three percent. Data showed foreign portfolio investments – mostly channeled to stock and bond markets – hit a 26-month high of $1.270 billion net inflow in January, indicating increased activity in the financial markets. The benchmark Philippine Stock Exchange index, for instance, has hit 20 record-highs this year, while Treasury bill and bond rates have reached record-lows due to strong demand. Officials said the “convergence” of strong growth and low inflation could persist this year, thus, driving more investments to the country. “The most recent available indicators continue to depict solid growth in the economy,” according to the highlights of the January Monetary Board meeting released last Thursday."